Inside Cover: The Rev. 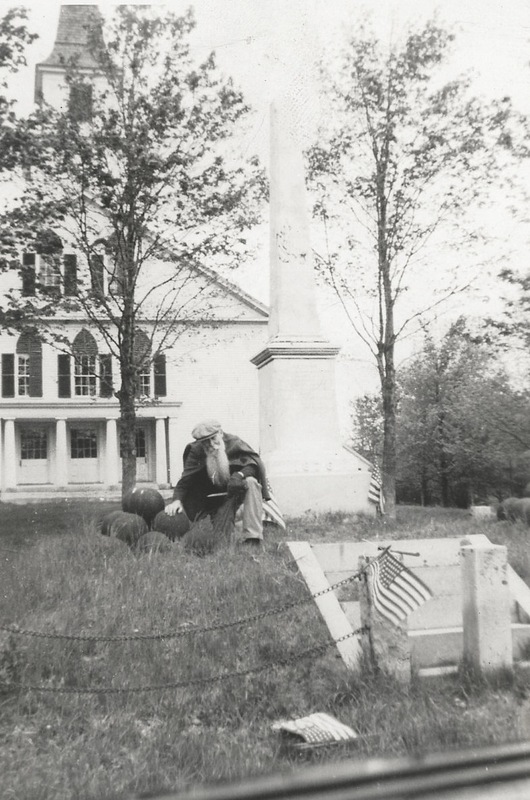 Millard Fillmore Hardy (1850-1937) on Memorial Day in Nelson, 1935. 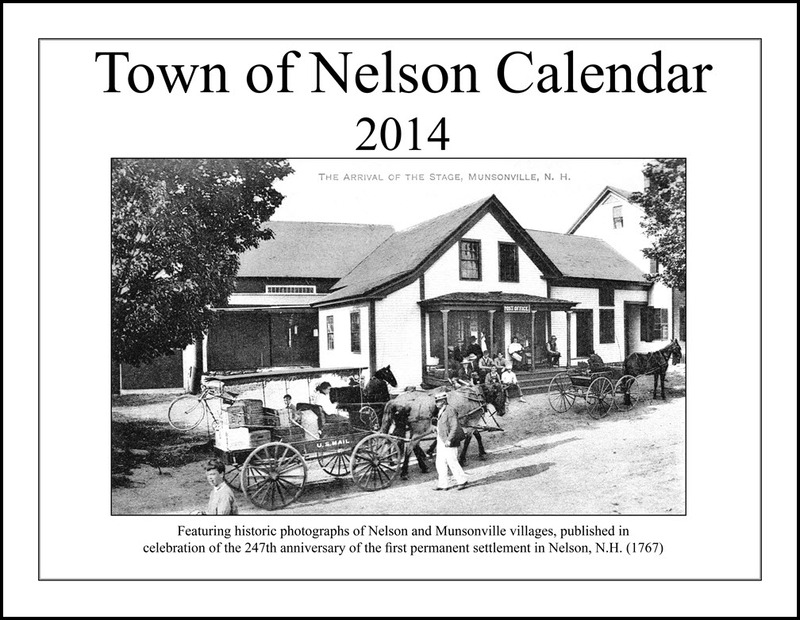 January: Settlement began in Nelson, then called Packersfield, in 1767. 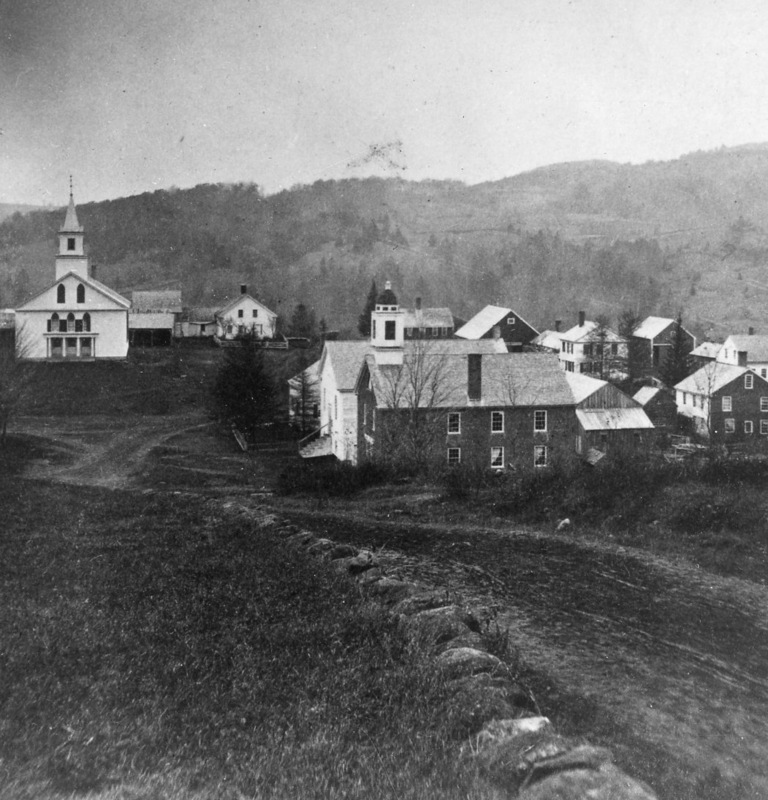 The first town meeting was held in 1772, but it was not until 1785 that the town voted to raise 30 pounds to support a “reading and writing school.” Prior to that date, Nelson’s children were encouraged to have instruction at home, largely focused on religious teaching. 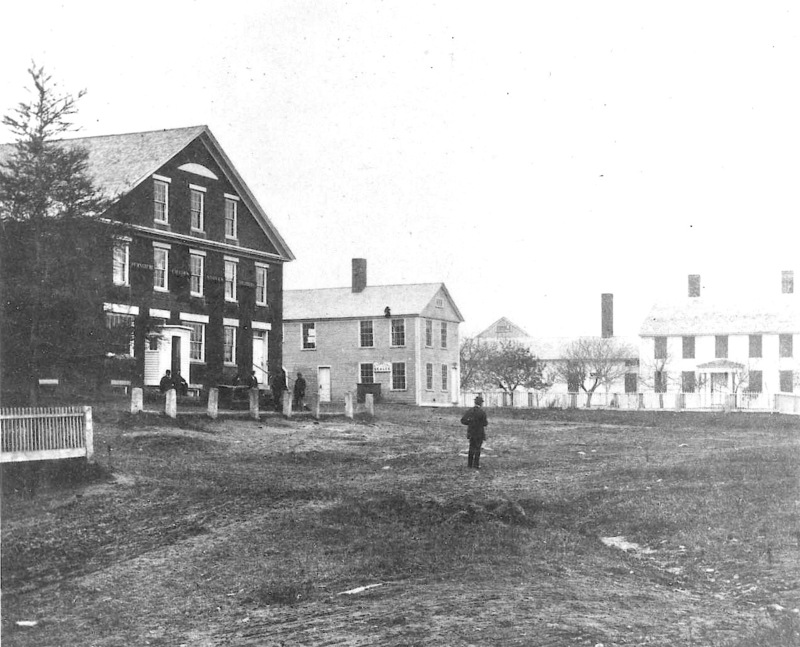 The first one-room school (District 1) was built on the hill south of the present village, across the road from the original meetinghouse (where the cemetery is now located). 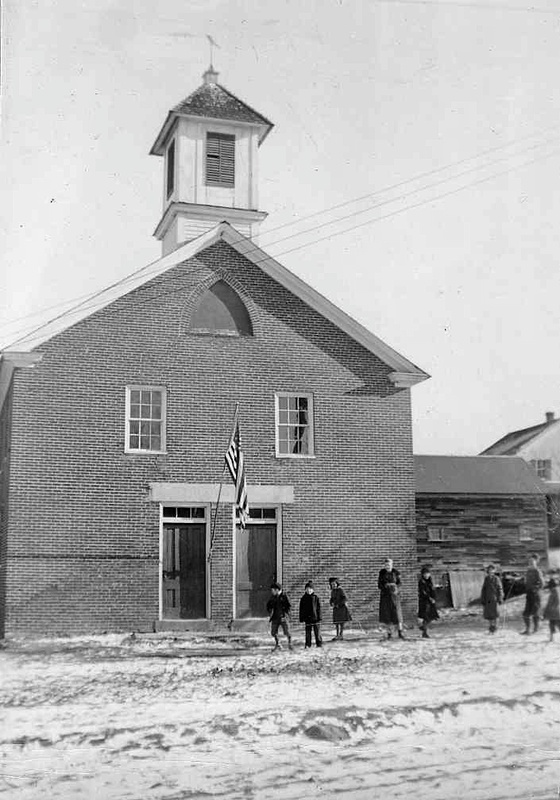 This photo from 1933 shows the District 1 brick schoolhouse built in the developing village in 1838 to replace the older wood-framed school. 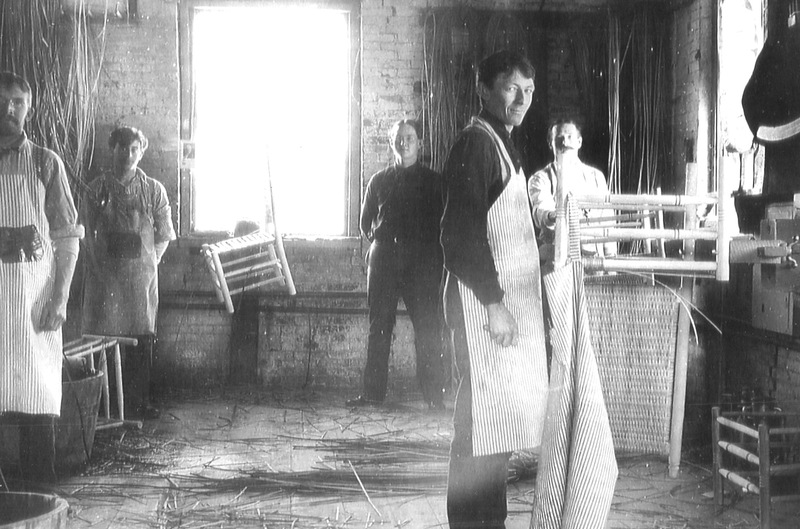 January: Interior of the Colony chair factory in Munsonville, c. 1880. March: Homer Farnum Priest’s Nelson House (which sold everything from feathers to stoves) and post office occupied the common in the village, facing the church, from 1840 to 1894, when it was destroyed in a fire. The adjacent center building, which had several uses, and the Priest House (now owned by Joan Gerbis) were built in 1840. Homer Priest ran the store and served as town clerk and state representative; his wife, Ethel, was the postmistress. They raised 13 children. April (and cover): Arrival of the U.S. Mail stage at Green’s Store and Post Office, Munsonville, about 1900. May: Festivities in Nelson village, 1885, featured a fife and drum corps. The house in the background is where the current library stands. The hill behind it is Osgood Hill, also known as City Hill. 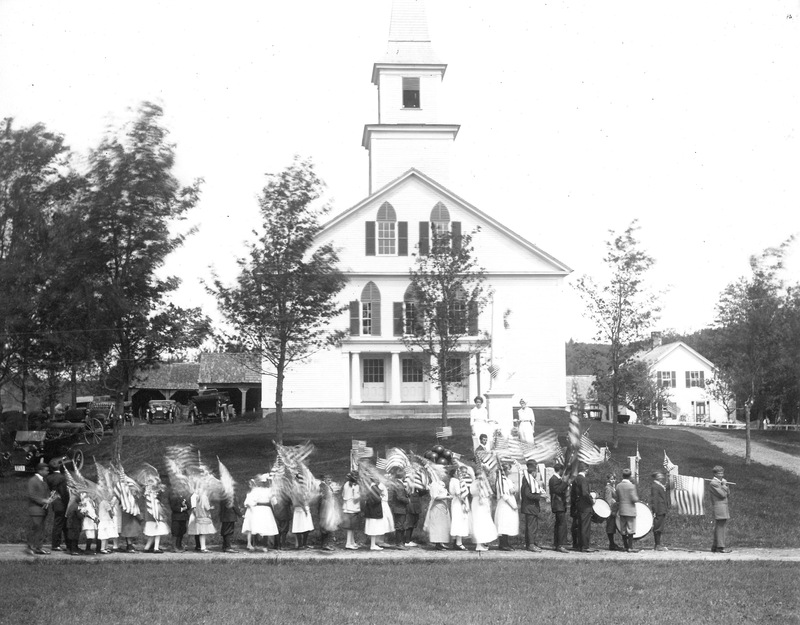 June: As part of the ceremony dedicating the Civil War plaque on August 18, 1915, Nelson school children decorated the soldiers monument in front of the church. July: The L.J. Colony chair factory in Munsonville, shown c. 1880, turned out thousands of basket-seat porch rockers and employed up to 25 people. 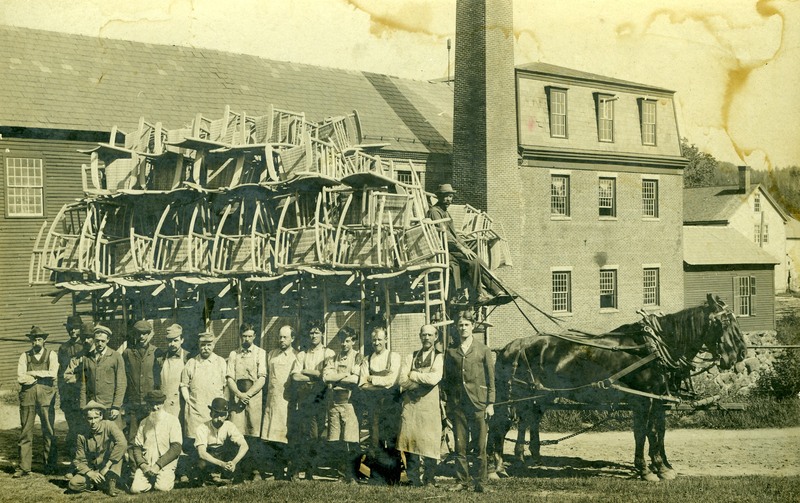 Chairs were hauled to Keene and shipped by rail all over the country. 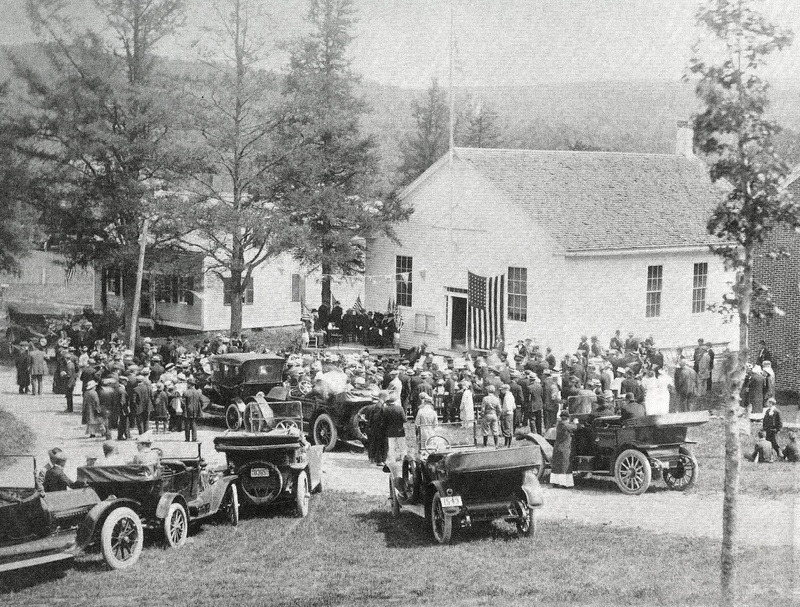 August: A considerable crowd gathered in Nelson for the dedication of the Civil War tablet on the town hall on August 15, 1915, the Nelson Picnic Association’s 37th annual gathering. Edgar Seaver’s band serenaded the guests. 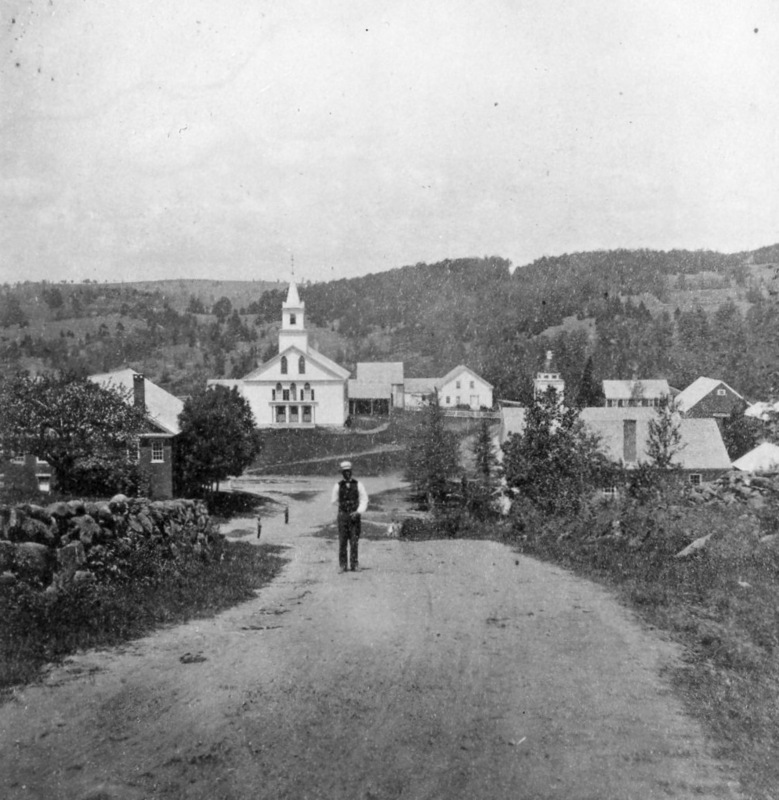 September: Captain Henry Melville (1858-1930), walking up the hill from the village toward his home, late 1800s. His great- grandfather, Josiah Melville (1752-1818), was one of the first merchants in town. October: In 1814, Asa Beard decided to take advantage of waterpower created by the damming of the outlet of Factory Lake, as Granite Lake was then known, and built a cotton factory and boardinghouse for mill workers at the site, the nucleus of the village of Munsonville. Alvin Munson bought the mill in 1843; L.J. and J.P. Colony of Keene acquired it after the Panic of 1857 and doubled the horsepower. 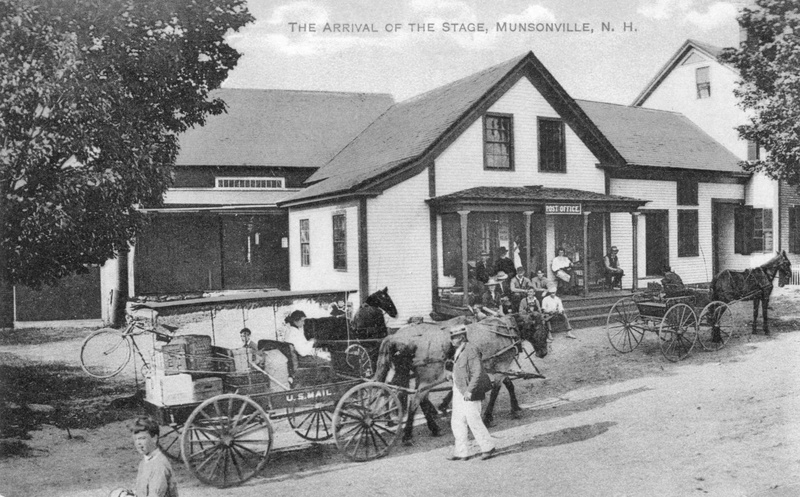 By then, Munsonville had become the center of manufacturing in town – first fabrics, then chairs and settees and supporting businesses, including a shoe shop, paint shop, and sawmill strung along the stream bank. 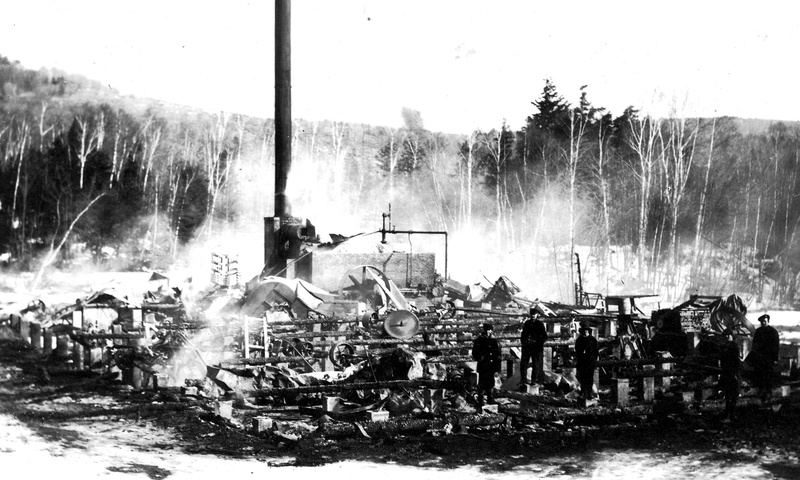 The mill burned to the ground (top photo) in 1877. L.J. 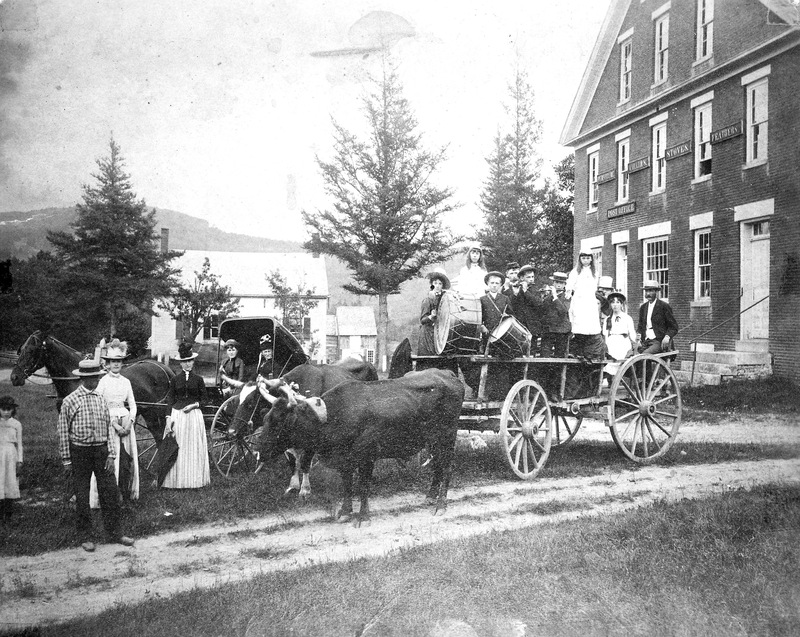 Colony rebuilt after the fire and helped make Keene the rocking chair capital of the country in the late 1800s. The bottom photo shows the rebuilt mill. 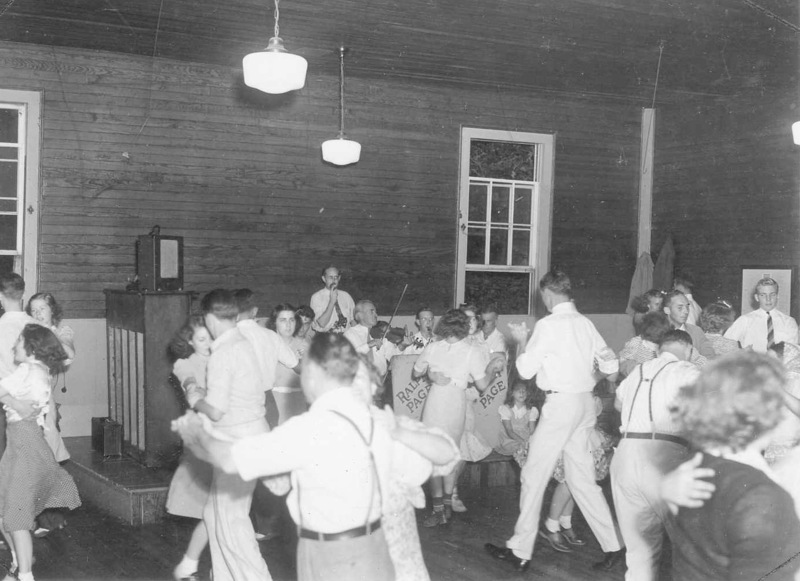 November: Ralph Page and his orchestra held regular dances in the Nelson town hall in the 1940s and 1950s, putting Nelson on the map as a mecca of contra dancing, a reputation it still enjoys. 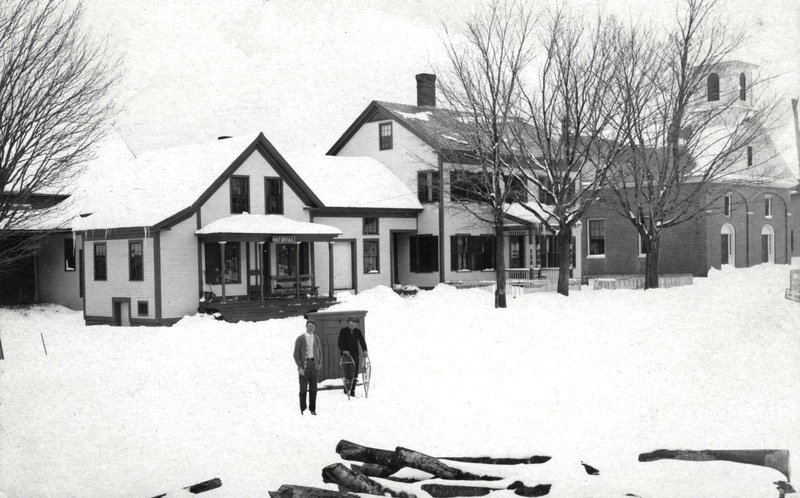 December: Green’s Store and Post Office, and the Methodist Church, Munsonville, c. 1900. The church took over Union Hall in 1891, with the stipulation that local Grange 115 could still hold meetings there. 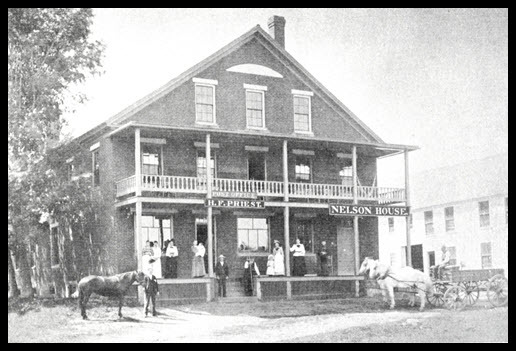 Nelson held its town meetings in the hall in 1891 and 1892, paying $5 in rent. Karen Tolman was going through some old pictures of Nelson not long ago and came across this picture of the center of Nelson, taken sometime in the late nineteenth century. Karen noticed that our town hall had front steps in those days, and that the building looked taller than it is today. Karen, Bert Wingerson, and Rick Church solved some of this puzzle using old photographs, original town records, an interesting deed, and a history of town buildings written by the Reverend Millard Hardy (1850-1939). The current village center was created around 1840, and part of that development was a large brick store built by Jonas Melville and Reuel Nims on what is the common today. (See March 2014 photo for a later version of the store.) Nims owned the land where the town hall is today, and he needed storage space for his mercantile operation. In 1846, he sold the Town the right to built a town hall on the land, provided it included an eight-foot-deep cellar that Nims and his heirs could use forever. That deed is dated October 1, 1846. In the Nelson Archives, we found an unpublished manuscript about the history of town buildings, written by Reverend Hardy, in which he describes the construction of the 1846 hall. People entered by climbing up a long flight of stairs to the main hall, which had rows of seats set on an incline. The basement was used for storing hogsheads of molasses and barrels of oil, commodities sold at the store. 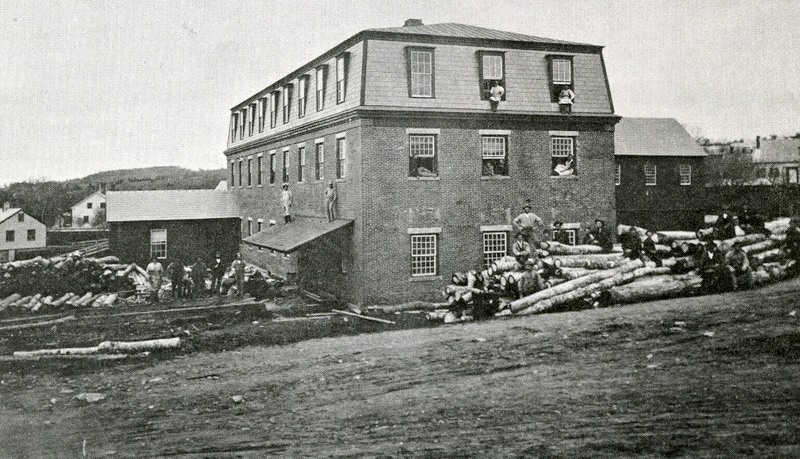 By 1859, the Nims store (later Homer Priest’s Nelson House) no longer required the storage area, and voters at Town Meeting instructed the selectmen to purchase the cellar and the adjoining land. In 1878, the Town voted to “take out the under part of the Town Hall and lower the house to the underpinning.” We can therefore date this photograph to 1878 or earlier. The town hall would go through several more documented renovations, as the generations went on, but the “elevated” version was one that took us by surprise.